A US$3.7 million grant will allow Purdue University researchers to study how blueberries reduce bone loss in postmenopausal women. “We are taking a systematic, deep-dive to learn if blueberries are helpful to counter menopause-induced and age-related bone loss,” said Connie Weaver, distinguished professor and head of nutrition science. The project begins on September 30, 2014 under a five-year grant from the National Institutes of Health’s National Center for Complementary and Alternative Medicine. Blueberries, from the family of vaccinium, are polypheolic-rich plant sources. Previous research in animal models and epidemiological studies show that polypheolic and flavanoids reduce age-related bone loss. Research on this topic is fairly new with some of the first findings published in 2008. 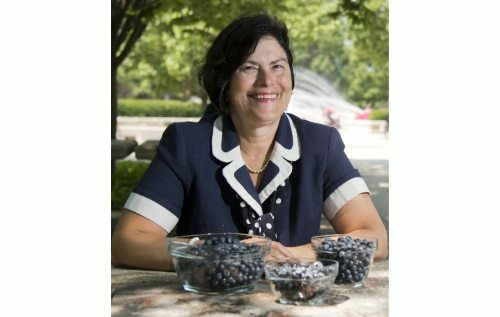 “How bioactive polyphenol metabolites from these berries protects bone is what we will try to answer, and it is our hypothesis that they help the immune system defend against bone loss,” said Weaver, who is an expert in mineral bioavailability, calcium metabolism, botanicals and bone health. She is working with Mario Ferruzzi, professor of food science and nutrition science, who is known for his work in bioactive food components and phytochemicals in food and assessing their bioavailability and distribution to body tissues. The project’s collaborators also include George McCabe, professor of statistics, and Elsa Janle, an associate research professor in nutrition science. The partnership includes investigators from Indiana University School of Medicine, David Burr and Teresito Bellido and Munro Peacock. All are experts in bone health. Burr and Bellido are professors of anatomy and cell biology and Peacock is a professor of medicine. “This is a strong interdisciplinary team, and we have the capacity to look at the big picture from profiling bioactive compounds to understanding the botanical aspects and connecting it all to bone health,” Weaver said. The first phase will focus on genetic screening. The researchers will be working with the Blueberry Genetic Consortium to profile 1,200 lines of blueberry varieties to determine the five that will be most effective. They also will look at other varieties of vaccinium, including white blueberry and cranberry. The second phase will evaluate the most effective dosage levels in humans. Weaver is a member of the Institute of Medicine, which is the health arm of the National Academy of Sciences. She is deputy director of the National Institutes of Health-funded Indiana Clinical and Translational Science Institute, as well as director of Purdue’s Women’s Global Health Institute. Story by Amy Patterson Neubert from Purdue University.